A group of citizens, officials and reporters on April 10, 2012, taking a tour of the proposed Castle Creek hydro plant location below the Castle Creek highway bridge. On the tour were two officials from the Federal Energy Regulatory Commission, which is reviewing the city of Aspen's application for the plant. ASPEN – City of Aspen officials are working to correct several mistakes in a report submitted last week to the Federal Energy Regulatory Commission regarding its proposed hydropower plant on Castle Creek. City officials say once the mistakes in the report are corrected, the estimate of net power to be produced by both the new Castle Creek hydro plant and the existing Maroon Creek plant will likely be shown to be 6.1 million kilowatt hours a year, down from a previously estimated 6.2 million hours. The report, as it was submitted to the federal government, indicated that the net power generated by both plants would be 5.4 million kilowatt hours. The report, an “assessment of project operation, stream flow and power generation” relating to the proposed Castle Creek Energy Center, was dated Wednesday, April 4, and submitted to FERC the same day. It was prepared by Kerry Sundeen, a hydrologist and president of Grand River Consulting in Glenwood Springs, who has been advising the city on its proposed hydro project for several years. At least some of the information in the report was specifically requested by officials at the FERC, which is in the process of reviewing the city’s license application for the new hydro project. Mitzi Rapkin, the city’s communications director, said that Aspen City Manager Steve Barwick noticed some of the mistakes over the weekend while reading the report, and that a story in Monday’s Aspen Daily News prompted other city officials to take a closer look at the report. Rapkin said the errors in the report led to errors in the news story, which she said was otherwise well-researched (see letter, page 8). 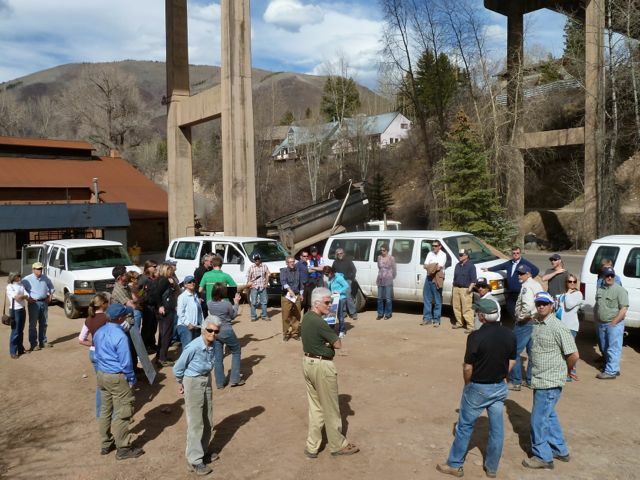 Officials from FERC are expected in Aspen today for a site visit and a public meeting about the hydro project. On Monday evening, Rapkin said there were apparently several errors in the materials used to prepare the report, including the elevation of Thomas Reservoir, which relates to how much force water would have as it enters the proposed Castle Creek hydro plant. Another mistake was that a side-stream that pours about 2 cubic feet per second (cfs) of water into Castle Creek near the Aspen Music School campus was overlooked, which means that more water may be available to power the hydro plant. And there was apparently confusion over the size of the pipe that city officials have already installed that will serve as a penstock to the new plant from Thomas Reservoir. While the report says the pipe has the ability to move 52 cfs of water to the new plant, which Rapkin says is correct, there were still apparently some erroneous calculations done assuming that the pipe was a 36-inch pipe, not a 42-inch pipe. City officials are convening Tuesday morning to continue to go over the report and nail down correct numbers on a range of calculations, Rapkin said. Once that’s done, the report will be resubmitted to the federal government. Editor’s note: This story was published in collaboration with the Aspen Daily News on Tuesday, April 10, 2012. There was an error in the Daily News story, as the city’s prior estimate of power production was 6.2 million kilowatt hours, not 6.4 million as cited in the Daily News story. The error was made by Aspen Journalism. It has been corrected in this story. Post-script: On April 12, 2012, the Aspen Daily News published an editorial on the city’s report and its handling of the mistakes. On April 13, Aspen Mayor Mick Ireland wrote a letter to the paper apologizing for suggesting that the newspaper, and the reporter, were at fault in the original story about the city’s report. As of April 26, the city was still working on correcting the report.